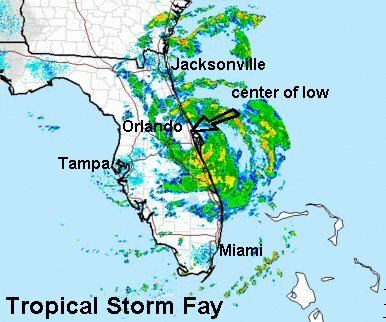 Fay is north-northwest of Lake Okeechobee by about 20 miles, just north of Basinger, FL. It continues to look very organized, not doubt helped by moving over the Everglades and in the path of very wet ground. Rainfall amounts have been the heaviest near and southeast of a line from Melbourne to Sebring to Ft. Myers. A general 2-6" rainfall has occurred southeast of this line down to the Keys with isolated 10"+ amounts. No doubt, a huge help for a very dry area. The forecast models are still calling for a track off of the Space coast then turning back west either in north Florida or south Georgia by later Thursday or Friday. NHC has hurricane advisories up for the 1st coast of Florida. We agree since Fay has kept its structure extremely well. It is likely to become a hurricane off of Cape Canaveral. On its present course, Fay may actually move offshore just south of Cape Canaveral near Melbourne. The couple of models that we've followed have done extremely well, pointing out this present scenario about 1 1/2 days ago. Those couple of models are making us look good. 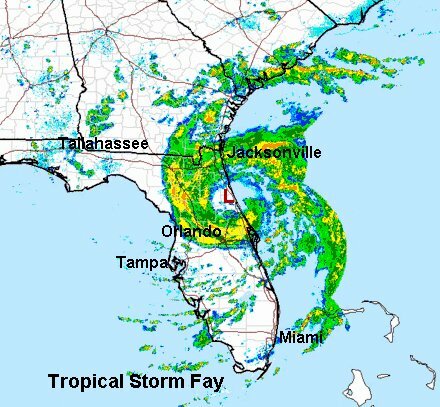 If Fay actually makes landfall at JAX, it will be a very, very rare feat. Because of the shape of the Florida coastline, tropical cyclones almost never make landfall there. As we mentioned earlier. We'll deal with the next phase of Fay as it moves west by Friday or Saturday and the possibility of it moving into the northern Gulf. Fay has undergone some very important changes in the last few hours. The eye like structure that formed Tuesday afternoon is now simply a small vorticy near the Indian River / Brevard county line. A much larger circulation has taken over, with the center now part over land and part over water near Melbourne. It will be interesting to see if the vorticity, which is rotating on the south side of the larger circulation develops into the eye of Fay. At this point it appears that Fay will still have a chance to become a hurricane. If the center can get 20 or 30 miles offshore the likelihood goes way up. Right now Fay is paralleling the coast. The high pressure system will eventually stop this northward motion and send Fay west. A troubling forecast trend.... The latest forecasts of one of the better models takes Fay into the northeastern Gulf and slowly moves it westward for three days and stalls it about 100 miles east of New Orleans. With the water temperatures very warm, Fay could strengthen into a sizable hurricane. This would be a very bad scenario if it plays out. Fay could create serious problems for the north Florida coast if that model verifies. That forecast brings Fay inland again in the western Florida panhandle Monday. Other models keep Fay farther north over land into north Florida or south Georgia. We need to watch this very carefully. A 50 mile change in the track could mean the difference between a tropical depression inland or a major hurricane offshore. Please do not panic. Everyone needs to watch this forecast closely. There is plenty of time to see which of the forecasts has the better chance of being correct. Stay informed and stay safe. It appears that Fay is not going back out to the Atlantic. The last several radar images show that Fay has stopped between Orlando and Titusville. The new circulation remains quite large as we outlined in our previous update. Heavy rainfall has been the main effect from Fay. Doppler radar has a general 4-6"+ estimate from east of Orlando to near and south of Melbourne. If Fay will be not heading out into the Atlantic it will be heading west in a weaker state. The two forecast models that we have been following still take Fay into the northern Gulf Friday and strengthen it before landfall later Sunday. The rest of the forecast models have shifted south, including NHC's official track. All of those remain inland with a track near Tallahassee. As we noted earlier, there will be a very large difference in what happens to Fay if it does make it into the Gulf.....a depression over land vs. a possible hurricane offshore. Could the two models we like best still be on track? It is definitely nerve racking, especially when NHC and the rest are still going with the northern track. As mentioned earlier, we have not committed to this track yet. A new model is coming in now. If it still stays south, that will be a least three model runs with the southern track. Fay continues to spin just to the north of Titusville. The circulation is very large, maybe about 75 miles wide. It appears that the exact center may be just offshore. A very heavy rain band continues into Brevard county. Doppler radar estimates that a large area of 8" of rain has fallen, with one very small spot of 18". It's hard to say if the radar is correct with that total. More rain will continue and the totals will continue to rise on the Space coast today. Southern Brevard and northern Indian River counties are getting flooded. 1. 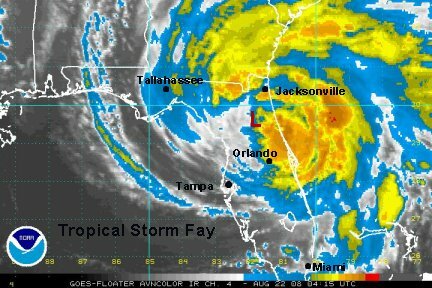 Fay stays inland across the panhandle. Result: Rain, heavy at times. 2. Fay moves on the course stated above, barely offshore. Result: Rain heavy at times, some beach ereosion, some gusty winds at the coast. Regains tropical storm strength (assuming it weakens into a depression before it moves toward the coast). 3. 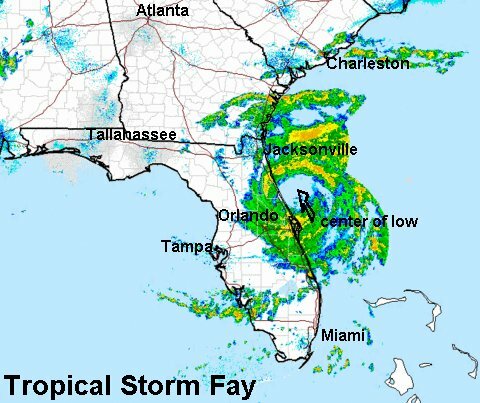 Fay moves 50 miles south of the north Florida coast. 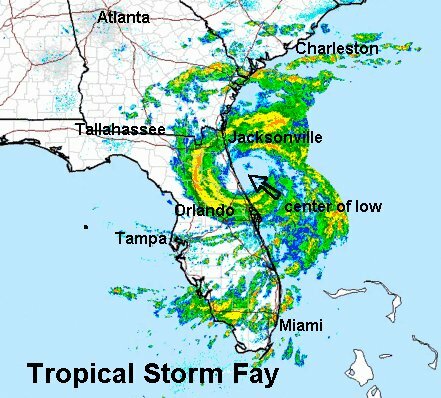 Result: Fay becomes a hurricane. Wind and surf damage. Heavy rain. The other model that we like will come in a bit later. Right now the compromise looks good. Barely offshore. Fay's legacy has been the drought breaking rains with it. That''s likely to continue into the weekend. 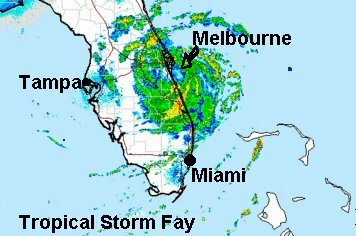 The radar loop out of Melbourne suggests that Fay is becoming better organized. It now looks to be about 20-30 miles offshore between New Smyrna beach and Titusville. Banding is increasing and the circulation center is becoming smaller. Daytona to St. Augustine needs to watch this closely this afternoon. The next full update will be this evening after the next run of models. 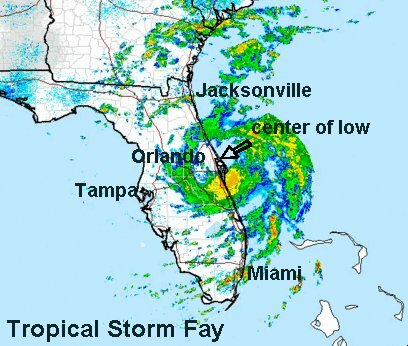 Fay is now offshore east-south east of Daytona Beach by about 30 miles. The circulation center is very large - about 50 miles wide. Rainfall amounts from earlier today indicated about 25" at Windover Farms, 18 1/2" at Viera and 14" at Cocoa between 2 am to 2 pm. Rain continues to come down, especially in Brevard county. There could be amounts over 30 inches in northern Brevard before long. The Hurricane Hunter last measured the pressure at 993 mb and estimated a surface wind of 40 knots. A flight level wind of 61 knots was also measured. The the wind is definitely getting stronger in the bands offshore. The forecast models have reached a consensus and take Fay west to near the northeastern Gulf. It may barely move offshore, but probably not enough to cause any significant regeneration. This was the first time in this forecast episode that our favorite models went outside of the consensus and weren't totally correct. 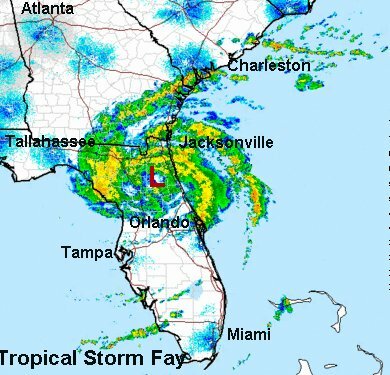 So, north Florida will continue to get pounded with heavy rain.....As Fay's legacy continues. Keep an eye on the development of the circulation off of Daytona for any strengthening this evening! It looks like Fay is having a go at strengthening. It may run out of time. The slightest hint of a westward motion is on radar. Rain continues to pound St. Johns, Flagler and Volusia counties. It's rotating southeast into eastern Orange and northern Brevard counties. 528 east of Orlando is about to get dumped on. Our next full update will be around 2 am edt. Any west motion that was detected earlier was obviously not associated with the general motion of Fay - It's still stationary. Rain continues to wrap around Fay flooding the Space coast and adjacent counties. Heavy bands of rain stretch from Flager county southward into Brevard and westward through Orange. The forecast models are still holding onto the scenario of a westward drift toward the Big Bend, into Apalachee Bay, then across north Florida emerging off the coast again near PC beach. Some models stall it south of Alabama or Mississippi until it starts moving northeast next Monday! So, the heavy rain legacy will visit north Florida too. 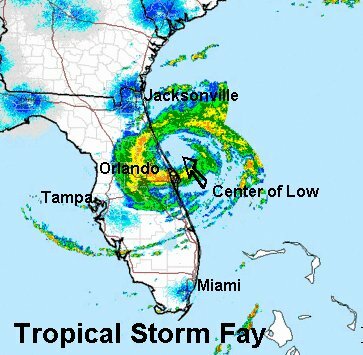 We are still a bit nervous that Fay has stalled east of Daytona. A due west motion will take it out farther into the Gulf. Let's hope the models are right and take Fay on a west northwest track just skimming the Gulf. We should know during the day Thursday as the anticipated westward motion should start. 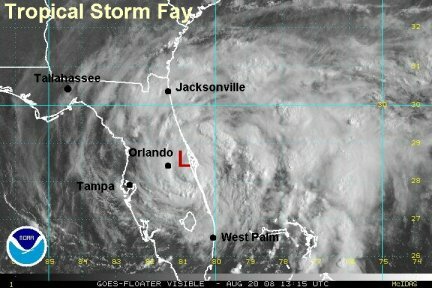 Not a good theme park day..... Fay is still sitting east of Daytona Beach with the slight hint of a northwest nudge. We expect within the next couple of hours the long awaited west or west-northwest trek to start. Rain continues to pound waterlogged areas. Scattered bands stretch from the coast of Georgia southward to St. Johns county where it starts becoming more solid. Heavy rain continues in Orange, Brevard,Osceola counties especially. There are many 10-20" rain totals in the areas that have been getting the persistent bands. The forecast models haven't changed much. 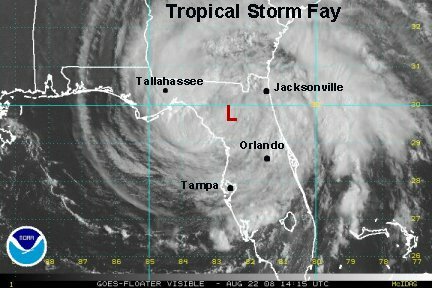 They still take Fay to the edge of Apalachee Bay then off shore of northwest Florida. It looks like a wet three or four days for northwest Florida. I mentioned that NOLA was not a concern. We still think that, but one of the models now stalls Fay a little farther west off of the Mississippi coast now, not bringing it inland until late Monday or Tuesday. Fay's westward track should weaken it considerably, so by the time it moves off of the northwest Florida coast should not be much. Fay has been a fighter, so we'll have to watch over the weekend for any redevelopment once it moves offshore - assuming that it actually does by any appreciable amount! Fay started moving in a west-northwest fashion a few hours ago. It looks more like a west motion at this time. The center of the large circulation is just offshore of Palm Coast north of Daytona. Just recently, a small vorticity has appeared onshore by Ormond by the Sea. If this is the true center, landfall has occured. The Hurricane Hunters latest reports have not differed from yesterday. The last pressure was 994 mb with an estimated surface wind of 55 knots. A flight level wind of 61 knots was also measured. Essentially identical to yesterday. The heaviest rains now have shifted to Jacksonville to Gainesville to Ocala to near and north of Orlando. This heavy rain will progress westward and Tallahassee looks to get soaked tomorrow. The models have not changed much, and it still looks like Fay will skim Apalachee Bay still then offshore Saturday near PC Beach. The models sit it just offshore until around Monday. The circulation of Fay remains large, so we will be watching for a scenario like off of the northeast Florida coast. If the circulation can stay intact enough by the time it makes it to northwest Florida and stays large, it may regenerate a little. It may strengthen just enough to be a rain making machine like the past 36 hours off of Daytona. 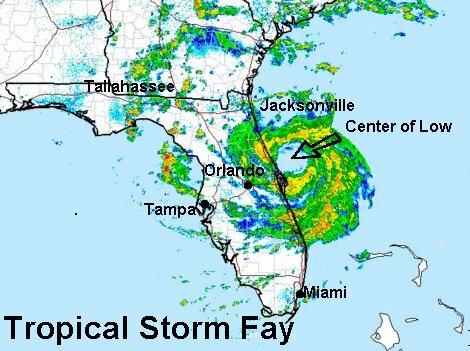 Fay made landfall officially near Flagler Beach at 2:30pm. It is now in western Flagler county. The heaviest rain is near Jacksonville, to Lake City, west of Ocala and south to Orlando. Heavy rain will move through the Big Bend and toward Tallahassee into Friday. The circulation on its present course will move across Apalachee Bay Friday. The models have not changed much for the exception of one now moving it briefly offshore of northwest Florida and back inland faster. 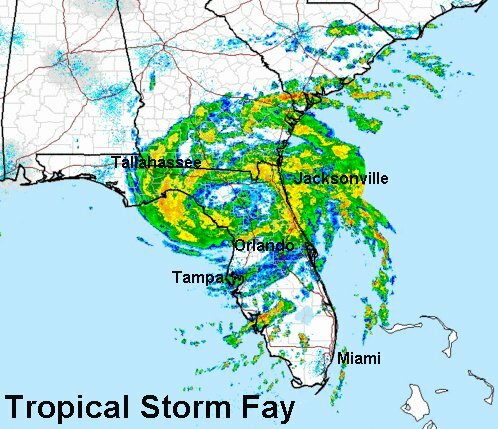 The consensus is that Fay will move over the coastal areas of northwest Florida through the weekend, then start moving north or northeastward into Alabama. The next more complete update will be around 2 am edt Friday. 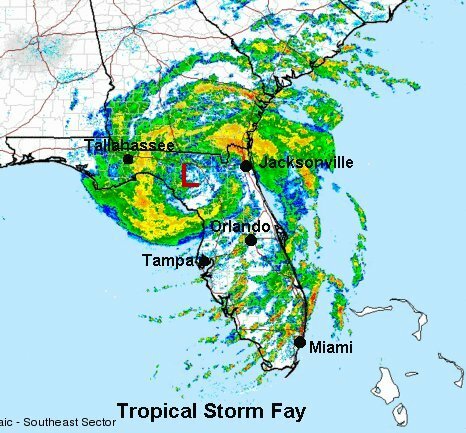 After starting to move late on Thursday, Fay stalled again. Not anymore. Fay has now picked up speed and is moving west toward Gainesville. Rain totals of 20-25 inches were reported in the Melbourne - Deltona - Cocoa region. It is amazing to see the "cut off" line of the precipitation. Northeast of Orlando a max of about 20" near Deltona and southwest of Orlando Doppler estimates of 1" or less. 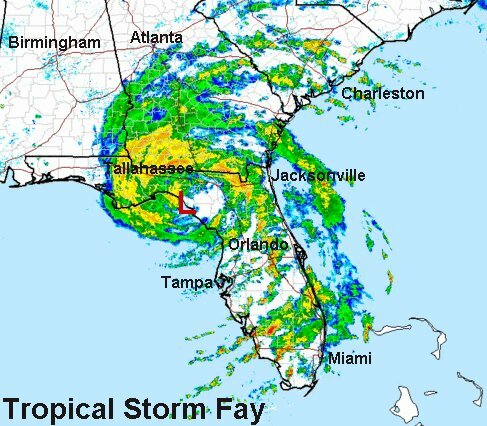 The state of Florida will remember Fay for a long time because of the incredible rainfall totals that Fay produced. One notable zone that has mostly missed Fay is from near Venice to a little north of Tampa. For other than a stray band, this area has been missed. Rain is increasing in the Big Bend tonight and heading toward Tallahassee for Friday. Beach erosion has also been one of the effects of Fay. The coastal zone from northeast Florida to South Carolina has had varying effects. Farther north, in South Carolina, it has been the gradient that has caused the winds to be strong. The combination of the low pressure from Fay and high pressure off of the Northeast coast. The models generally take Fay over Apalachee Bay then along the northwest coast into the weekend. The difference is now between what happens after that. Some stall Fay south of Alabama or Mississippi others move it north. We don't have a strong opinion on the next phase yet. It's interesting to note that we dissed our favorite models a bit yesterday, but it looks like they did pretty well after all. NHC and the rest of the models moved closer to our solution bringing Fay down along the coast. Next...landfall #4 on Dog Island Friday???? The rain from Fay has made it west of Tallahassee. Two areas of especially heavy rain are located in the St. Johns valley and over Apalachee Fay. Jacksonville continues to get soaked. Tampa is getting some rain with a band finally setting up there. Doppler estimates a widespread 8"+ of rainfall now in the St. Johns valley. No doubt, there are considerably higher totals there. 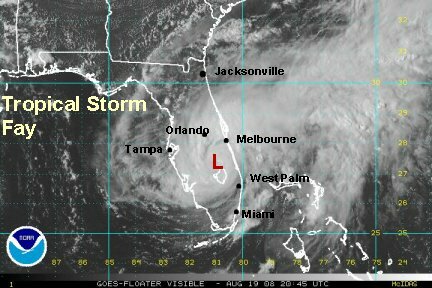 The center of the low took a small jog northwest and is centered about 20 miles northwest of Gainesville. The forecast models resume the westerly motion and still take the center over Apalachee Bay later today. The forecast models take it offshore barely of the northwest Florida coast through the weekend. Some now drift it toward Louisiana and other take it north into Alabama by Monday. Either way, much more rain is on the way for northwest Florida. At this point Fay probably won't make it offshore enough to regenerate, but we will be watching it closely! 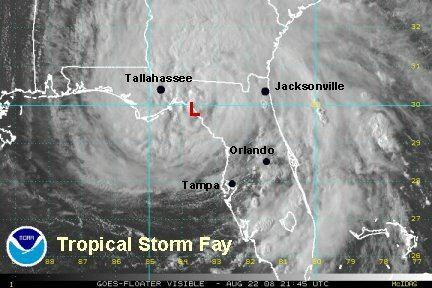 Fay is now centered near Lafayette county heading for Apalachee Bay by this evening. Rainfall amounts have now been estimated over 15" near Jacksonville, with the heaviest rain shifting near and north of town into south Georgia. Cocoa Beach's last total now at 33". Snakes and, gators have been sited in some of the towns in eastern Florida swimming in the streets. Be extremely careful A large mosquito outbreak is also being predicted by health officials in 1-2 weeks because of the flooding rain. Fay's direction is shifting slightly, consistent with the forecast models. It is now moving just south of due west. This should take it into Apalachee Bay then skim along the north Florida coast or just off shore through the weekend. Again, some models bring it inland Sunday near Mobile or Pensacola, others keep it stalled for another couple of days. Heavy rain will advance across the panhandle though the weekend into Alabama and Georgia through next Tuesday or Wednesday. Fay is now moving offshore Taylor county west of Keaton Beach. It will make its 4th landfall tomorrow morning probably north of Dog Island near Lighthouse point. Seas will be around 9 or higher in the squalls in Apalachee Bay into Saturday. Rainfall is heaviest across south Georgia from east of Valdosta to Bainbridge then south to just west of Tallahassee into the Gulf near Apalachicola. Some new Doppler estimates are in the range of 5" southeast of Tallahassee in western Taylor county and 5-10" in southeast Georgia. Outer bands still are as far south as Orlando and Miami. Keep in mind that a tornado watch is still in effect for NE Florida, southeast Georgia and parts of coastal South Carolina. The forecasts have done remarkably well. Our favorite few models picked the Apalachee Bay crossing at least two days ago, even when the "spaghetti plots" and most other media had the low moving over Tallahassee. The 30-40 mile farther south difference is significant in the sense that it will help sustain Fay's circulation closer to the water. The models still take Fay offshore barely near PC beach. It if actully makes it offshore, a fifth landfall will occur. Most models now move it inland near Mobile or Pensacola on Sunday. It then meanders or loops through western Alabama and eastern Mississippi until <b>Tuesday</b> when it should start moving northeast. Alabama and eastern Mississippi are next in line for the rain. North Georgia may (hopefully) start seeing rain with the best chance Monday and Tuesday.